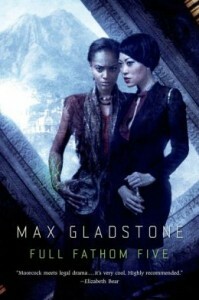 Substrate update: Max Gladstone is a Campbell nominee, and new excerpts from his latest! I'm actually reading (and enjoying) Samatar's Stranger in Olondria in my current pile (which is divided among review books, jury books, and picture books...), and Chu's Lives of Tao/Deaths of Tao look right up my alley. Naam is a computer scientist and futurist as well as an SF writer, and though I'm not usually a thriller reader, I'm definitely intrigued by his profile. Sriduangkaew got nominated on the strength of her short fiction; according to other blogs that I've read, that happens very rarely. Regardless of who wins, the future of SF is bright! Speaking of the future being bright, in July, my so-far favorite of Max's Craft-verse books, Full Fathom Five, comes out! Better yet, you can read the first five chapters at Tor.com right now!